Beijing 2012: MG Icon SUV concept | What Car? The MG Icon SUV concept has been revealed at the 2012 Beijing motor show. It's a compact SUV that would be a rival for cars such as the Nissan Juke and Skoda Yeti, and could go on sale in 2014. The Icon is a five-door hatchback with back doors that are hinged at the rear, as on a Vauxhall Meriva, to help access to the second pair of seats. 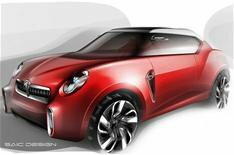 The car is around four metres long and is based on the platform of the MG3, the supermini already on sale in China and due to arrive in the UK in the next 18 months. The Icon is the work of freelance designer Steve Harper, whose previous projects have included the MGF. His styling, conducted between a studio in Shanghai and MGs design centre at Longbridge near Birmingham, references many classic MGs. There are clear cues from the MGB, particularly evident in the headlights, front grille and tail-lights. However, Harper says the brief given to him by MG design boss Tony Williams-Kenny was for a vehicle to remain modern. Harper also revealed that the car has been designed with production in mind. 'Part of the brief was to keep one eye on production feasibility,' he said. In the more immediate future, MG is showing the full production version of the Focus-rivalling MG5 at the Beijing show. The car has retained the clean lines of the original concept, although some of that cars sharper edges have been softened. It seems a spacious five-door hatch, with decent leg and headroom in the rear seats - but the dashboard plastics still look a notch below those in established European rivals. MG is also referencing its recent involvement in the British Touring Car Championship, with a pair of BTCC specials based on the MG5 and the larger MG6.